HUNTSVILLE, AL--(Marketwire - January 28, 2008) - Avocent Corporation (NASDAQ: AVCT) today introduced a new version of the Emerge® MPX extender, the MPX1500 high-definition (HD) multipoint extender, which wirelessly distributes HD content from a single source to multiple destinations. Emerge MPX extenders can be deployed for a variety of professional video applications, such as digital signage -- providing panels with live content, entertainment and advertising in retail outlets, theaters, restaurants, airports, etc. 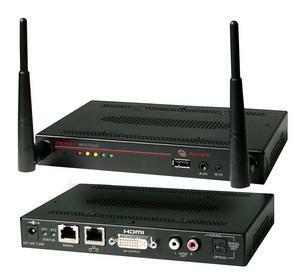 The MPX1500 has added new functionality for centrally managing the MPX extender devices over the Internet. The AV infrastructure created by the MPX extenders can be centrally accessed and controlled through a Web management interface. This latest version of the MPX extender greatly expands the status information available, enabling not only general troubleshooting of connections, but more specific details to ensure uptime and reliability. AV and IT managers can now connect to each individual transmitter and receiver to reboot, update, adjust the luminance and chrominance, change the frequency the radio transmits, and various other tuning parameters. For a widely dispersed digital signage network, this eliminates the need to send technical staff onsite for troubleshooting and repairs. "When it comes to digital signage, Avocent provides the connectivity piece of the puzzle -- we're the only vendor who can deliver content wirelessly from a source to multiple displays, enabling broader reach and further penetration by eliminating the need for a physical wired connection to deliver audio and video," said Mitch Friend, senior vice president and general manager of Avocent. "With the introduction of the MPX1500, we've added a number of features to make it easier for integrators to use and centrally manage their digital signage systems." The MPX1500 receiver has a universal media port based upon a digital video interface (DVI) connector, supporting a wide range of analog and digital video formats rather than requiring separate interface modules. The new MPX extender is dramatically smaller than the previous version making mounting the device easier and more convenient. Additional details about the MPX1500 and the entire Emerge MPX family can be found at www.avocent.com/proav. The MPX1500 is available now and priced at MSRP $995 U.S. Demonstrations of Avocent's New MPX1500 will take place at the Integrated Systems Europe tradeshow, Avocent booth Hall 1, Booth #I119 in Amsterdam, Netherlands January 29th - 31st, 2008; the Screen Expo tradeshow, Avocent booth #C01 National Hall, Olympia, London February 5th & 6th; the Digital Signage Expo tradeshow, Avocent booth #529 in Las Vegas, Nevada February 27th - 28th, 2008.